Tsunku produced Hello! Project unit V-u-den (Viyuuden, Biyuuden or Byuuden) will release their first best album, “V-u-den Single Best 9 Vol.1 Omaketsuki” under the PICCOLO TOWN label. The album will include all nine of their previously released singles including, “Jaja Uma PARADISE” and “Koisuru Angel Heart” plus a new song called “FANTASY”. The group was formed in August 2004 with current members Ishikawa Rika (Leader), Miyoshi Erika and Okada Yui, and first debuted with the single, “Koi no Nukegara”. They also released their first album, “Suite Room Number 1” in October of 2005 and it debuted at #14 on the Oricon Weekly Album Ranking. The normal edition CD includes a photocard. The four-piece band GARNET CROW just released their twenty-sixth single “Sekai wa Mawaru to Iu Keredo”, and is currently the 28th ending theme song for the NTV Anime series Meitantei Conan. This will be the group’s third single release this year including “Namida no Yesterday” and “Kaze to RAINBOW / Kono Te wo Nobaseba”. The new single just debuted at #10 on the Oricon Daily Single Ranking published today. Members of GARNET CROW are Nakamura Yuri (vocals, songwriting), Azuki Nana (keyboard, lyrics), Furui Hirohito (keyboard, arrangement) and Okamoto Hitoshi (guitar). They first debut with the single “Mysterious Eyes” in March of 2000 under the GIZA label. BoA (20) will be releasing her 24th Japanese single, “LOVE LETTER” on September 26th. Originally, the release date was set for the 19th but was pushed back a week later after news of Hamasaki Ayumi’s newest single, “talkin’ 2 myself” was going to be release on the same day. “Diamond Heart” was used as the background music for the Toshiba Play-T W53T/W54T TVCM (TV commercial) featuring BoA herself. “Beautiful Flowers” was chosen as the theme song for the Yokohama BayStars, a baseball team in Japan’s Central League. The first press CD single will include a Winter Acoustic Mix of “LOVE LETTER” as a bonus track. Noriko Sakai’s new single, “Sekaiju No Dare Yori Kitto“, is being used as the theme music for the Toyota NOAH commercial. 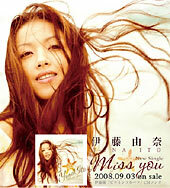 Her new single will be released on August 22, 2007.